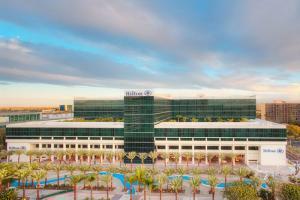 The Hilton Anaheim hotel is adjacent to the Anaheim Convention Center and steps from the Disneyland® resort. The hotel pampers each guest with familiar comforts and fanciful amenities. Hilton Anaheim hotel's iconic floor-to-ceiling picture windows frame commanding views, including theme parks. Luxury abounds with the hotel's recreational amenities, as well as entertainment and dining galore on The Avenue, a good-time district right in the hotel. Located in downtown Anaheim, one block from Disnleyland and 35 miles from Los Angeles. Starbucks, Hastings Sports Lounge, Cafe Oasis (casual all day dining), Sushi Bar, Pavia (Northern Italian Fare), and Gazebo (casual poolside grill).